thats cool rocket there.but why ? set the target date of oct31 there. thats halloweenie there..?? cant nasa speed it up a little like early in october to me hallowsween is something else. hope to see it go off there.. The large holes in the support structure really put the Ares V in perspective with the two solid rocket engines on the sides. This is so exiting. I have been watching the progress carefully since the start of project constellation. It is good to be near the first launch now. Good luck! Ares 1-x! Uh… Looking at this, I really start to wonder if NASA is on her right way. I don’t know the calculations but I really doubt this rocket can fly. It’s a real beauty, and impressively tall. Looking forward to the first test flight!!! Already looks wicked & very different from a normal rocket. Looks great! How will NASA ensure that the boilerplate and the dummy J-2X matches the actual one not only in weight but in average density and covering material etc ?? Does the Dummy J-2X have the same outer coating as the actual version (as outercoating affects the aerodynamics) ?? its good to see all the parts fitting together, do you work at weekends ? Wow That is some impressive ship! cant wait for the test flight, thumbs up! Wonderful! but why so late? What is the reason of continous postponing of the flight. I know there aree some concerns about stabillity, but this doesn’t explain everything.Maybe I’m wrong, but I think that when the rocket will be assembled, little can be done in that matter. This mission is crucial, because it is showing all the sceptics that NASA is really doing something. Peolple have enough computer animation, they want to see the rocket on the pad, and later in the air. Want acting, not complaining about possible technical difficulties, lack of funds, and so on. Supermassive. 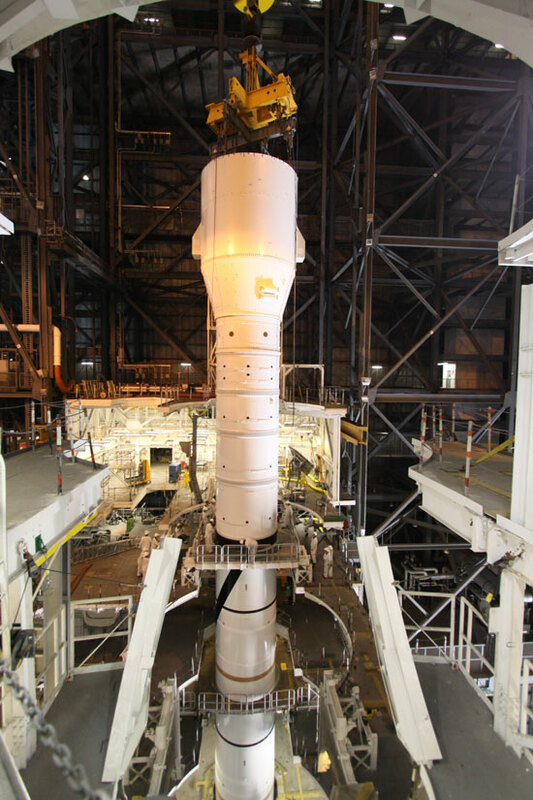 The Eyes of Texas are upon you: GO Ares 1-X! Great pics! I think it will be difficult for us to gain a true perspective of how tall the Ares I-X is until it rolls out of the VAB. Imagine what an Ares V will look like! this is confusing without a scale comparison. How tall is this compared to say, storeys of a building? I hope the Ares really does do what it was made for and does it well because focus is something that has been lacking and its about time we stop sticking to our laurels and push some imaginations to LEO and beyond. 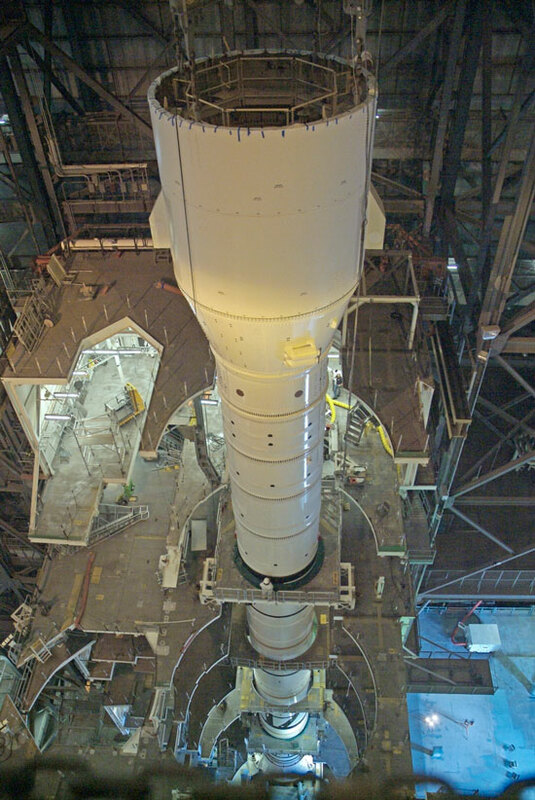 Building stories are usually estimated at ten feet, so the Ares being more than half way assembled probably puts it somewhere around the height of a 16-20 story building. The building is massive on the inside. It is deceptively tall because it is so long and wide. There was quite a breeze at the doors because of the climate/ pressure difference between the inside of the building and the outside (it has it’s own internal climate). The center section was open all the way to the roof, and I just stood there and stared for a little while. 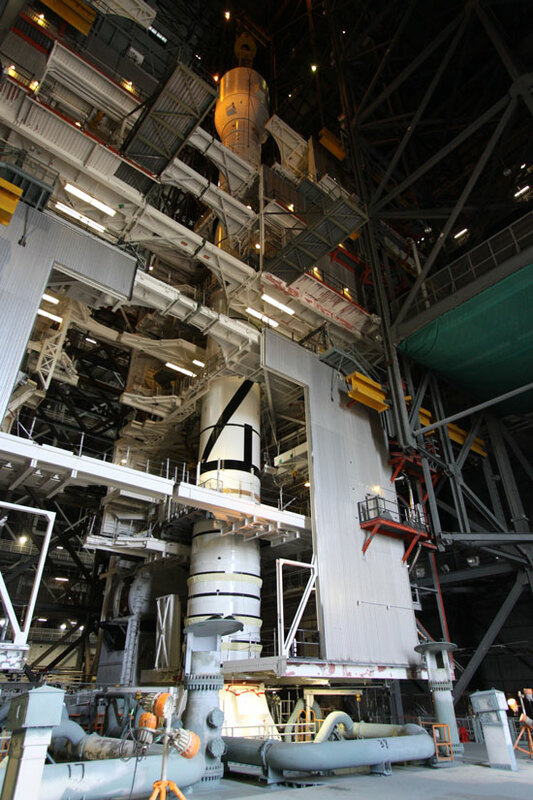 There were work bays on either side similar to what you can see the Ares being stacked in in these pictures. Actually, here are a few photos I took if you care to see them. (http://www.flickr.com/photos/27870058@N02/sets/72157617971689161/) I have more that need to be added. I remember the first shuttle launch as if it were yesterday and I remember the apollo mission launches and the astronauts who walked on the moon. They inspired me to a lifelong love of space and space flight. I hope that when Ares1-X finally launches that it will be the start of man’s further exploration of the solar system and beyond. From over this side of the pond may I wish you all the success and well being possible. Hi there this is just a little info for those that are not sure of the hights of these new ares rockets. 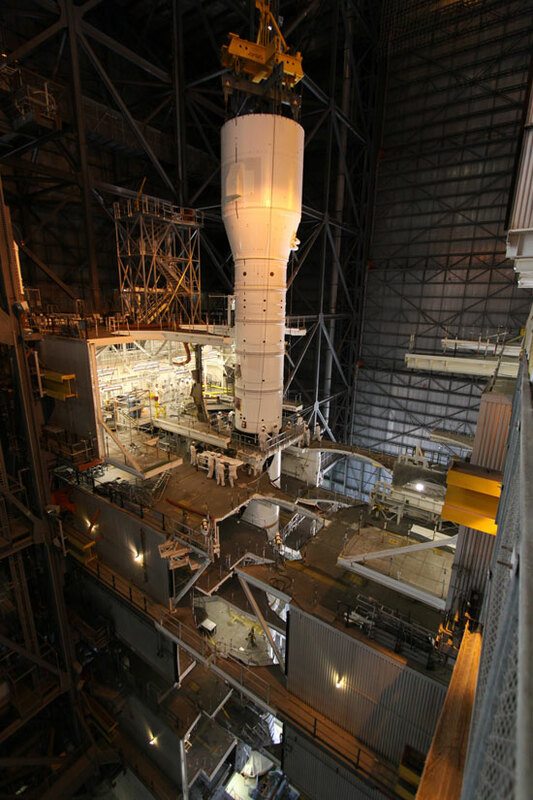 The Ares 1 will be 325ft high,and the Ares V will be wait for it!! 381.1 ft high! !.Thats higher than a Saturn V at 363 ft!!. I would imagine that the 1X test rocket would be the same hight as the fully comleted Ares 1. Just thought you might like to know . Me too chris 1981 feels like it just happened,and i remember watching the apollo 11 moon landing in 69 i was six then,and the others upto 1972 .Really looking forward to Ares 1X test flight. Just think in a few years time we will have the unbelievable opportunity to see men and women stand once again on the moon, that’ll be twice in one lifetime mind blowing.And in live HD !!. Hope to go to florida for the final shuttle launch in may next year. What a blow it will be if this vehicle isn’t allowed to launch by obama! Such a waste of man hours money an expertise dedication . I’m very worried that constellation might be muddied and watered down,this project needs proper funding .!!! With the cancellation or drastic reduction of the Ares program, we will have no manned access to the space station that America built! Only 6 more shuttle flights, then that is the end. The US will opt out of space exploration in favor of executive bonuses and mindless give aways. Next Next post: Introducing 327 Feet of Ares I-X Rocket!